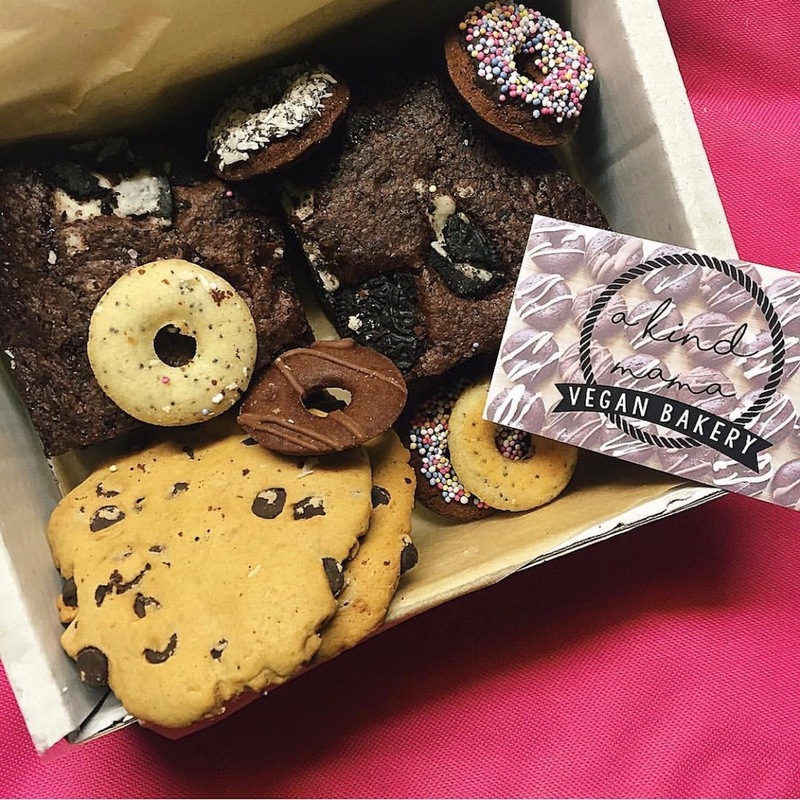 A box filled with a selection of tasty vegan treats! Lovingly handmade, and baked fresh in A Kind Mama's kitchen. Free from: egg & dairy. Please note: items are only posted on Wednesdays and Thursdays so please bear this in mind when ordering. Please contact me if you need any help. Brownies: plain flour, white sugar, cocoa powder, baking powder, salt, dark chocolate chips, soya milk, vegetable oil, vanilla extract. 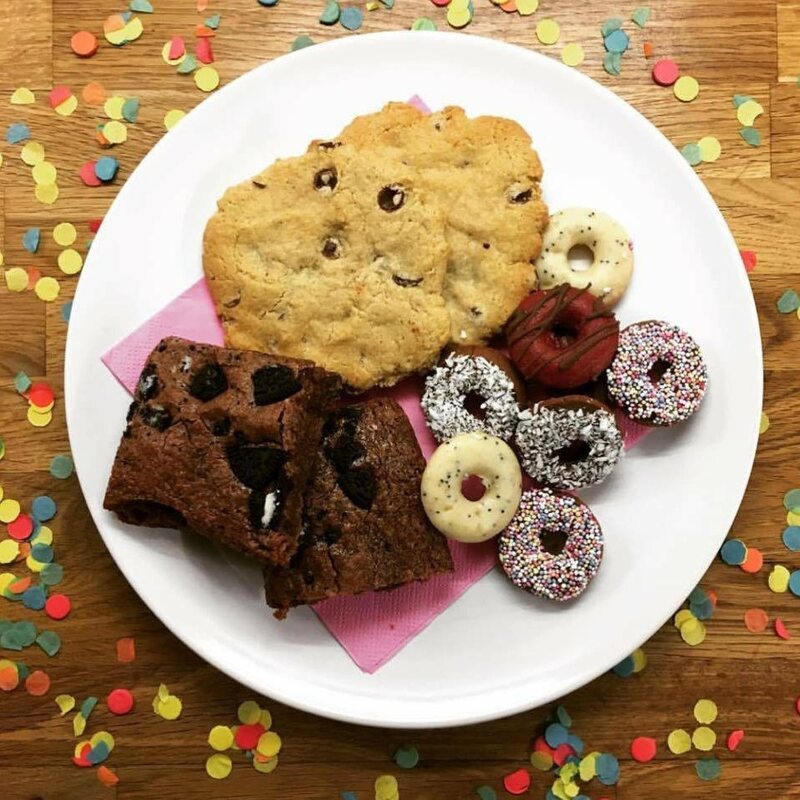 -Chocolate & sprinkles: banana, coconut oil, vanilla extract, soya milk, plain flour, white sugar, baking powder, cocoa powder, salt, hundreds & thousands, vegan milk chocolate. -Chocolate orange: banana, coconut oil, orange extract, soya milk, plain flour, white sugar, baking powder, cocoa powder, salt, vegan orange chocolate. -Chocolate & coconut: banana, coconut oil, vanilla extract, soya milk, plain flour, white sugar, baking powder, cocoa powder, salt, dessicated coconut, vegan milk chocolate. -Lemon & poppyseed: banana, coconut oil, lemon extract, soya milk, plain flour, white sugar, baking powder, poppyseeds, salt, icing sugar. Chocolate chip cookies: plain flour, white sugar, light muscavado sugar, vegan butter (vitalite), dark chocolate chips, vanilla extract, soya milk, baking soda, salt. Contains: wheat, soya. Made in a kitchen where nuts are present. Just delicious..only tried the red velvet and lemon and poppy seed so need to try more. Donuts were awesome. I will definitely order again! A present for my granddaughter who thought they were so scrummy she had to eat them within two nights! Brownies were scrumptious. Thank you!! Delish brownies and fabulous baker! Delish brownies and fabulous baker! 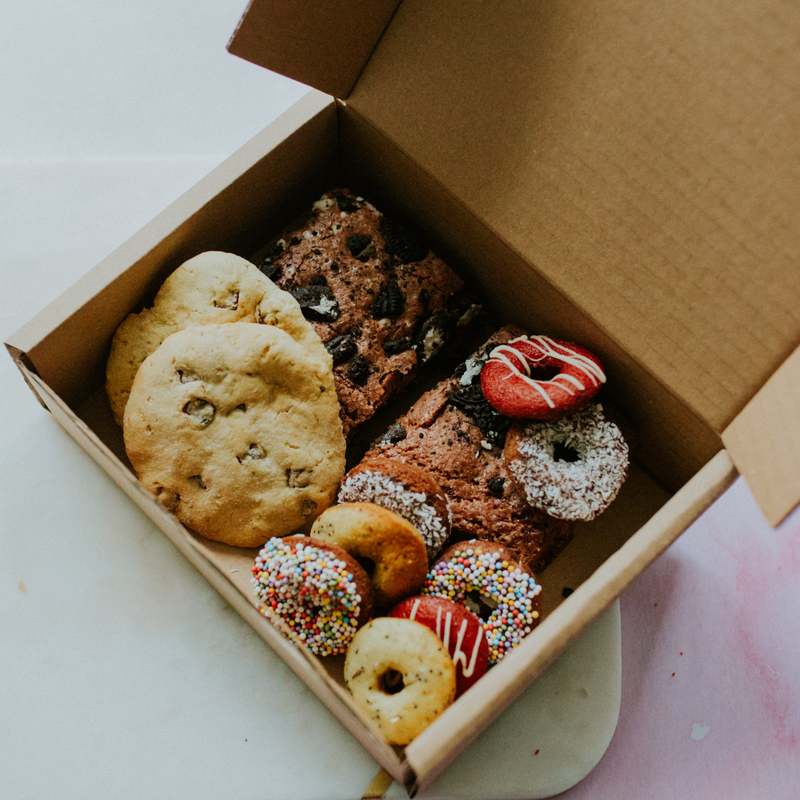 Birthday goodies delivered to put a big smile on the recipient's face. Excellent will defo order again! I was personally really disappointed with this box. I was personally really disappointed with this box. The brownies didn't have the texture of brownies, more of a moist cake texture. I've had, and made, plenty of vegan brownies in the past so don't see why they were this texture. The donuts were awfully dry. I ended up throwing them away because they were just chewy. Not remotely like a donut. The cookies were OK because I really like a crunchy cookie but in terms of flavor they were bland and the chocolate chips were minimal. Maybe I just got a bad box because the other reviews are great, or maybe it was the heat... but I would definitely not recommend.